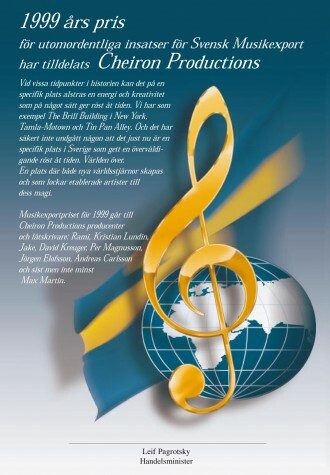 In January 2000, Cheiron Productions’ songwriters and producers were awarded the Music Export Prize by the Swedish Government. The 1999 prize for outstanding achievements for Swedish music exports is awarded to Cheiron Productions’ producers and songwriters. Cheiron write and produce music for global artists such as Backstreet Boys, Britney Spears, N’Sync and Céline Dion. The 1999 Music Export Prize goes to Cheiron Productions’ producers and songwriters: Rami, Kristian Lundin, Jake, David Kreuger, Per Magnusson, Jörgen Elofsson, Andreas Carlsson and last, but not least, Max Martin. « The story behind Britney Spears' "Sometimes"